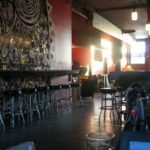 The Pinhook is Durham’s premiere venue for live music, dance parties, basic chilling, and collaborative / creative events. We are a safe space for lgbtqi folks, POC groups, punks, lawyers, cyclists, trivia nerds, and everyone else. We are also a bar, so come after work or early evening and enjoy the best beer and community Durham has to offer. Weekends of Musical Mayhem — featuring the best bands local and national acts around. Nightly specials – the perfect way to make cheap drinks even cheaper. A Patio Out Back! Our patio is so awesome. I love you, patio. But the most important thing we have is YOU. The Pinhook is YOUR place. We believe that communities thrive when there is a public place for their citizens to be themselves, whether on stage or on a barstool, relaxing or rocking out. For Durham and the Triangle, the Pinhook is that place.